So this was a movie I came upon when I read a countdown list on best back-to-school films. I saw that it starred Judd Nelson and I was very intrigued, as I love Judd Nelson. I have to say that on a whole I thought this movie was okay. 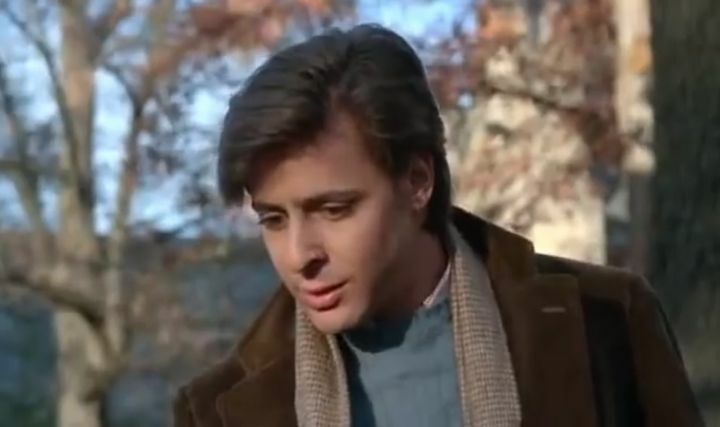 Judd Nelson was awesome and hot as always. I mean I love him in The Breakfast Club, but you can’t go wrong with a well-dressed man. However, I didn’t like his friends as I felt they were just using him to a) defend them, b) make them popular, and c) to pick his brain about how to date and interact with girls. I ABSOLUTELY hated the girl who becomes his girlfriend. She was a rich snob and horrible girl, who was trying to be more accepting of the lower classes, as she is dating a man who has “new money”. Gross. What a jerk. Anyways, so let me get to the synopsis. Palmer (Dana Olsen), is a lazy, rich boy. He’s been kicked out of over 7 schools, yes 7, and finds himself at his father’s limit. If he doesn’t finish college this year, than no trust fund, no allowance, no anything; he’ll be forced to get a real job. Eddie is living on the street, and trying to make ends meet. He owes a bookie a ton of money and has no way to pay it back. He flees for his life and runs into Palmer and his problem. Palmer agrees to pay all of Eddie’s expenses and a $10,000 bonus if he pretends to be Palmer and graduates for him. Now Eddie isn’t exactly the Ralph Lauren type. He actually does great academically, but the “upper crust” social skills are nothing like he’s used to. However, everyone but the prep trio; Bif, Skip, and Bland; enjoys the changes he starts making as he shakes the campus up. Eddie falls for the daughter of the school founders, Tracey Hoover (Joanna Lee), and begins trying to romance her away from Bif, fascinating her with his breakdancing and “normal everyday” person attitude. Problems arise when Dice, the bookie, tracks Eddie down and tells him that he’ll have to pay all his winnings to him. Muffy, Palmer’s girlfriend, keeps showing up and causing issues with Tracey. Palmer himself comes back from Europe, and chills on campus, his partying and attitude causing issues for Eddie. Bif tries to destroy Eddie and Tracey’s romance and the headmaster tries to kick Eddie out. To top it off, Eddie finds himself becoming a mega-preppie jerk and losing who he is. So about halfway through the movie Eddie and Tracey have been dating and are a thing. Muffy comes traipsing by and causes Tracey to become jealous. Muffy thinks Eddie is “Bif” Palmer’s friend and keeps coming to visit Palmer, finding herself hanging out with “Bif”. After Palmer comes back and dumps Muffy, she goes to see “Bif” and ask him for help. Unfortunately, at that same time Tracey has arrived with a silver platter of food (I guess rich people’s version of a picnic? I’m not sure), and sees Eddie and Muffy walking off together. Bif comes up to Tracey and insinuates that Eddie and Muffy have been hanging out a lot and doing more than that. Tracey storms off, determined to never speak to Eddie again. Eddie of course, has no idea why Tracey won’t talk to him anymore, as he keeps calling her and calling her. He decides to go on the offensive and and delivers tons of flowers, of all different types. But that doesn’t work. Eddie then goes to plan B. 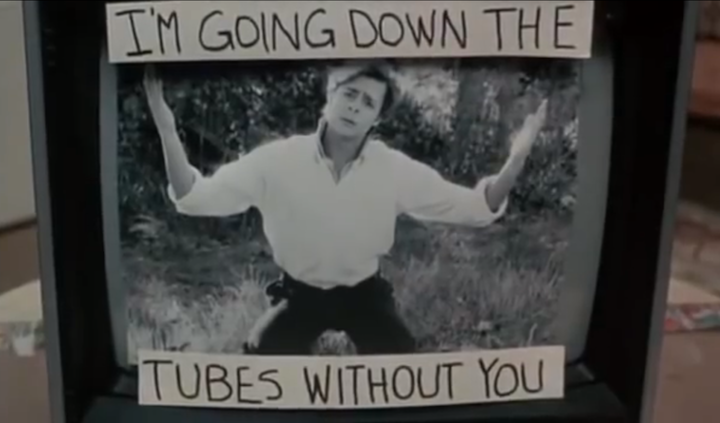 He sends her a TV with his picture and the words “I’m going down the tubes without you”. Isn’t that adorable!!!! I just find it incredibly cute and original. I mean it’s no holding the boom box over the head by John Cusack, but it is still incredibly amazing. I just love it! It may not be what most people consider romantic, but this has got to be the best “sorry” ever. This entry was posted in Romance is in the Air III and tagged '80s film, '80s Hair, All About the '80s, Allowance, Back to School, Bookie, Breakdancing, College, Countdown, Dana Olsen, Date, Defend, Dice, Flowers, Going Down the Tubes, Jealous, Jonna Lee, Judd Nelson, Lazy, Lazy Rich Boy, Lower Class, Making the Grade, Muffy, New Money, Offensive, Owes Money, Palmer, Party Boy, Party Girl, Picnic, Popular, Prep, Ralph Lauren, Rich Girl, Rich Girl Meets Poor Boy, Rich Guy, Silver Platter, The Breakfast Club, Tracey Hoover, Trust Fund, TV, Upper Crust, Well-Dressed.